Om Shanti Hosana malayalam movie, the directorial debut of Jude Antony Joseph will feature Nivin Pauly & Aju Varghese in lead. Teaming for the 6th time, the success duo has already shared screen space for Malarvadi Arts Club, Sevenes, Thattathin Marayathu, Bhoopadathil Illatha Oridam and Chapters. Young film maker Jude Antony Joseph is gearing up to make his debut in tinseltown. Titled 'Om Shanti Hosana', the movie will feature Nivin Pauly & Aju Varghese in lead. Teaming for the 6th time, the success duo has already shared screen space for Malarvadi Arts Club, Sevenes, Thattathin Marayathu, Bhoopadathil Illatha Oridam and Chapters. 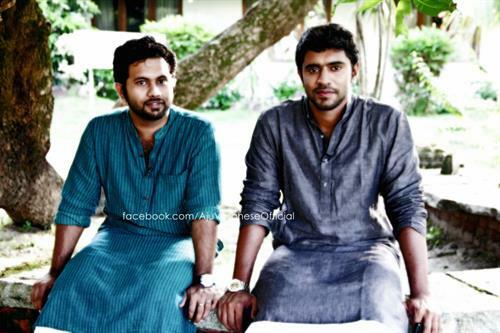 As like in Thattathin Marayathu, Aju plays the character role of Nivin Pauly's best friend. Nivin, as a young man keeps close company with his friend in all his needs. But when the friend gets into problem, he would disappear from the sight leaving no marks of his presence. Nivin and Aju associated with the malayalam film industry for the past 3 years had been giving their best performance on their respective characters. Nivin is having a good time keeping his foot strong in the industry. While his recent bilingual movie Neram getting positive reviews from theatres, the actor will be seen in Shayaparasad's English, Arikil Oraal, 1983 and Motorcycle Diaries. On the other side Aju Varghese is on cloud nine with number of movies already in kitty. Getting featured in Neram, the actor would don important roles in Zhachariyayude Garbhinikal, Paisa Paisa, Rasputin and Pianist. In Aneesh Anwar's 'Zachariyayude Garbhinikal, he plays Ajmal who has love interest towards Fathima enacted by Rima Kallingal. But the height difference keeps him away from revealing his love for her. As Nivin Pauly & Aju Varghese have already presented their chemistry on the silver screen, Om Shanti Hosana too is expected to bring out the best from the lucky pair.